A wide variety of options are available for upgrading fine coal in the size range between 0.15 and 1mm. 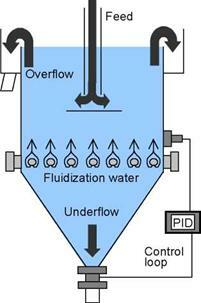 Common methods include water-only cyclones, spirals, and teeter-bed separators. 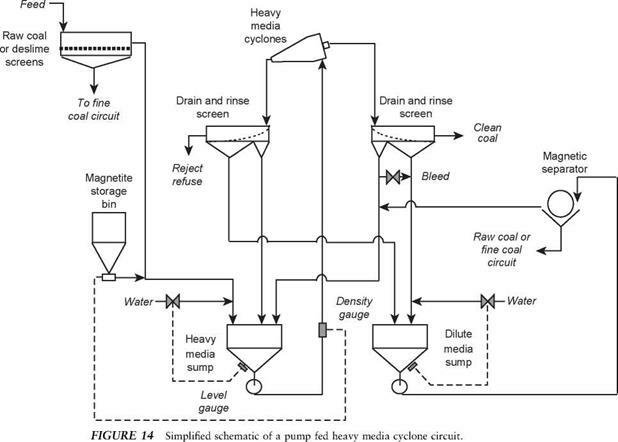 A water-only cyclone (WOC) is a water-based process that employs no extraneous media to separate rock from coal. 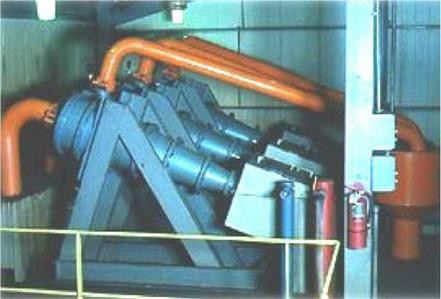 Water-only cyclones were introduced in the early 1950s for the treatment of fine coal (<5mm). Water-only cyclones are similar to classifying cy­clones, but typically have a somewhat stubby wide­angled conical bottom and are usually equipped with a long axially mounted vortex finder. Separations occur due to differences in the settling rates of coal and rock in the centrifugal field within the cyclone body. The separation is also enhanced by the formation of autogenous media created by the natural fines already present in the feed slurry. 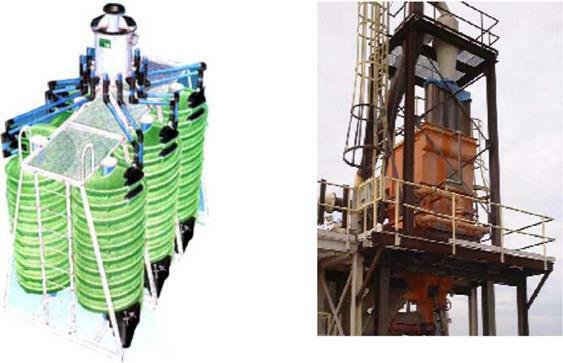 These units are often employed in two stages or in combination with other water-based separators to improve performance. Water-only cyclones do offer some advantages for selected applications including high throughput capacity, operational simplicity, and low operating and maintenance costs. A separator that has grown tremendously in popularity is the coal spiral (Fig. 15). A spiral separator consists of a corkscrew shaped conduit (normally four turns) with a modified semicircu­lar cross section. The most common units are constructed from polyurethane-coated fiberglass. Illustration of a heavy media cyclone bank. Courtesy of Krebs Engineers. secondary circuit, which is often 10 to 20% of the size of the primary circuit, enables any misplaced material from the primary circuit to be captured. Circuits have been designed to use spirals in treating wider size ranges (e. g., 0.1 x 3.0 mm), but perfor­mance has been poor and efficient spiral cleaning at present would appear to be limited to the 0.15 x 1.5 mm size range. The main advantages of the spiral circuits are comparatively low capital and operating costs coupled with ease of operation. A major drawback of spiral circuitry is the inability to make a low gravity separation since spirals normally cut in the 1.7 to 2.0 SG range. A consistent volumetric feed rate and minimum oversize (>2mm) and undersize (<0.1 mm) in spiral feed are also essential requisites to good operation. Spirals have been successfully utilized in combina­tion with water-only cyclones to improve the efficiency of separating fine coal. Latest spiral technologies incorporate primary and secondary cleaning in a single unit. Clean coal and middlings being produced in the upper section are reprocessed in an extended spiral totaling seven turns. FIGURE 15 Illustration of a coal spiral. Courtesy of Multotec. FIGURE 16 Illustration of a teeter-bed separator. Courtesy of Eriez Manufacturing. (ash) are possible. Operating and capital costs are high. spirals. The major unit disadvantage is the limited size range which can be efficiently treated (4:1 top size to bottom size).